When a friend handed me a bag of small bugle beads that she inherited in a button bag from a relative, I wondered immediately how I could create something from a type of bead that I generally have not used, particularly considering my penchant for peyote stitch, flat, circular, and otherwise. She told me to "play" and come up with something she'd like, and she named a vey healthy price range. I thought and played, and played and thought. 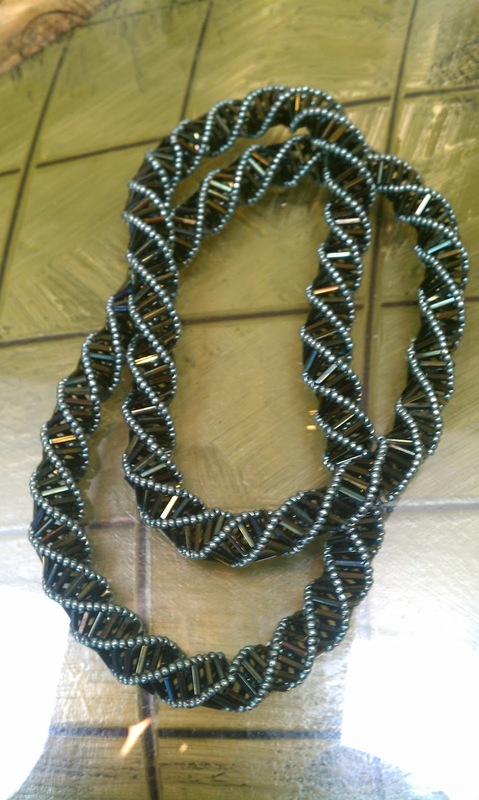 First, I created a series of beaded beads from the bugles. They could have become elements of a necklace or bracelet. Nice, but not for my customer (but perhaps for something later consideration using bugles of my own). Then I used the bugles to create a fringe to circle a cabochon. Too fussy for my customer. (Again, an idea for the future). Finally, she told me she wanted something long and "drape-y" Well, at last, some direction! The helix that you see hit me immediately. It's a long necklace; just what she wanted. Next time, if I do something like it in lighter colors, I'll consider suspending some dark-colored swarovski crystals or perhaps some dark pearls within the tube. Could that be a great idea? In the meantime, I've created some sea-dwelling creature that undulates like a jellyfish found in the depths of the depths that recently were plumbed by James Cameron in his miniature submersible. It's an "under the sea" creature, particularly in those wonderful shades of green. My customer is happy as a clam. What do you think?